1. 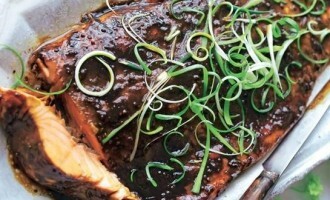 Blend together the treacle, lemon juice and mustard and put in a dish, large enough to hold the salmon. Put the salmon in the dish, skin-side up, making sure it is well coated, refrigerate for at least 1 hour. 2. Pre-heat the oven to 180C/160C/Gas 4. Line a roasting tin with foil. Remove the fish from the marinade and put in the tin, skin-side down. 3. Crush the fennel seeds in a pestle and mortar. Sprinkle over the fish and season with salt and pepper. 4. Cook in the oven for 25-30 minutes or until the flesh flakes easily. 5. Sprinkle the spring onions on top before serving.